Thanks for a great vehicle and great service. We loved it. We hired from you this year at very short notice. Picked up and set down at airport,even allowed vehicle for an extra couple of hours f.o.c. because of flight timing. Service was excellent thank you, the vehicle a big Hi ace was easy to use and very economical. My own Regius does some 10l/100k, its diesel, this one although petrol returned 13l/100lt. Was a lot bigger and higher. Very well equipped and spotlessly clean, gave zero trouble, came with maps and so forth anda very handy guide to free sites which was very useful. Would undoubtedly hire from you again and have told all the family and friends to visit Tasmania and hire from Tassie motor shacks. At Beauty Point Tasmania at the moment - We have to say, this Tassie Motor Shacks Camper Rentals is really spacious, the bed when made up is huge, and there is ample storage once Nick got things sorted out. We are really comfortable, it is a great way to travel Tasmania! 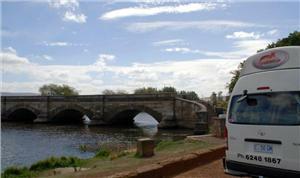 The van was great, well-equipped, comfortable and perfectly suited to what we needed for a couple of weeks touring. The real bonus though was the kindness and helpfulness we experienced in dealing with you and your staff from the moment you met us in Hobart bus station until the point of our departure when you suggested that our son and his girlfriend ran us to the airport in one of your vehicles. It`s hard to imagine that we would have had such a friendly welcome and treatment from some of the bigger companies. Finally, an especial thanks for the generosity you showed towards Will and Tamie in letting them stay on at Seven Mile Beach for a couple of nights after we left, at no extra charge. They certainly appreciated it and we did also on their behalf. Once again, thank you for everything and all the best for 2013. I have travelled to many countries and all over australia working humanitarian missions. I happened upon Tasmania by fate really, I thought, while I was here, I would hire a campervan so i could travel and have a place to sleep if I couldnt get a room in my travels. I did a quick google search on my iPhone, and found the prices advertised by some name brand hire places had low prices, however, when i asked, there were so many hidden costs which actually made them more expensive. Some even needed many thousands up front for insurance! Try adding $50 plus, dollars a day for insurance etc. Fee for this, fee for that. I can't say Tassie beach shacks was my first call, however, I am so glad I called. Not only was the price quoted the genuine price, the staff were genuine as well. What is my motivation for writing this? Because of all the places I have been, i can honestly say, the staff here are second to none! They actually helped me plan my impromptu week long trip. Remember the days when you shook a mans hand and it was a deal, well, that's what I got. Sure there are papers to sign, however, the staff focus was on my happy, trouble free trip. The van was great, not a bit of trouble, unlike at least four other "logo painted" vans i saw which were broken down. I saw 3 for sure and a suspected 4th. I remember thinking...that would spoil a holiday. Anyway, The van I had didnt miss a beat. I slept one night in a motel, all the other nights were in the van. It was so comfortable and functional, that I didnt need a room. I did shower at the caravan parks or under a waterfall (just so i could experience one) The van was like a fitted out " electricians type van" it was perfect. I could sit up in bed, cook when it rained etc. all bedding, dishes, cooking, water, electric lights, sink etc were supplied there was even a fire extinguisher and first aid kit. The layout even had an outside table and several awnings. These were extra by the way with the others. Included with Tassie motor shacks. After my trip, I handed the van back, then my flight was cancelled (thanks a lot Jetstar...never again) guess what, the staff went out of thier way to give me a place to sleep over night!!! They didnt even charge me the room. This feedback is about quality of service and genuine people. Good old fashioned service you don't get much any more. Yes...I am pleased to put my name to this company. We had a great time for 2- months wandering around Tasmania.and being in a van made it so much easier,the good people at tassie motor shacks….Rob and Jo, made us feel so welcomed after picking us up at the airport,a cold beer and a happy smile,we knew that we had picked a winner. for the rest of the day we were out-fitted,shown maps,given locations of off the beaten path,we set out on a trip of a life-time,Tasmania is truly a wounderous country and with the van it made it so easy…no hidden cost,the qoute they give is the price you pay..this is the only rental van co. that allowed you to go on un-sealed roads.and if you have been to Tasmania,half the country is un-sealed.the van we travelled with had every-thing we needed for the extended time in country.We are headed back to Tasmania in 2013 and this part of planing is easy..lifes a beach- in a motor shack…Thanks for all the good times! On top of that, after hiring more campervans in Australia, we believe this is undoubtedly the best service around!! We hired the budget campervan for a month over Christmas. As we were hiring a van for a whole month and we are backpackers, we did a lot of research into the cheapest we could find. Tassie Motor Shack was by far the best and cheapest, the van itself was extremely well maintained and for a budget campervan had everything we could possibly need to live in comfort for a month. Its probably the best budget campervans you will come across and most come with awnings for no additional costs. The best thing about Tassie Motor Shack is they allow you to drive on unsealed roads and I doubt you would find it easy to find another hire company who would do the same. As there are so many roads in Tassie that are unsealed this is definitely one of the best things about hiring from Tassie Motor Shacks. The owners will go out of their way to provide you with everything you need! They were amazing! They picked us up from our hostel in Hobart and took us to the seven mile beach holiday park to pick up the van, gave us loads of extras in the van such as gas bottles and gave us loads of advice on hidden gems to visit in Tassie. When we returned we had an early flight the next day and they gave us a free nights stay at the caravan park as well as a 6 pack of beers! They really made us feel welcome and went out of their way for us. If I return to Tassie I would never use any other company but Tassie Motor Shacks! Simply the best you’ll find!! I recently did a 2 weeks tour with a Tassie Motor Shacks van. As the peak season was in full swing I found all the other companies to be booked out. Finally I was told by some other travellers to try Tassie Motor Shacks. They told me quite convinced that this company is just the best you can find in Tasmania. Looking back I can totally confirm that. And because their rental conditions are really outstanding I just thought this information would be very useful to other travellers. If you compare their prices to all the other options you have in Tasmania you will find that they offer great value. Additionally a very important point is, that their insurance liability is by standard $1000 without any extra charge on top of the daily rent. And while driving on gravel roads normally is just prohibited, Tassie Motor Shacks requires no additional cost in case of an accident on a gravel road. It is obvious that if you strictly stay on bitumen you will miss out a lot of places. You won’t even be able to access most of the national park camping sites. So many travellers use the gravel roads on a very high financial risk. In case of an accident it doesn’t matter if the other party was driving reckless and one is not at fault at all. You would have to pay an amount of money that is definitely blowing the budget! The car you get at Tassie Motor Shacks is easy to drive, well maintained, neat, tidy and not comparable to some of these shabby ones you get if you are going for the budget way. You don’t have to pay extra fees for any equipment, not for the chairs and the table, not for the awning, the heater etc. as you normally will find it a common practise of rental companies. Their depot including a nice and relaxed caravanpark is at Seven Mile Beach outside of Hobart. They even pick you up at he nearby airport or at any other place in Hobart. You get a very friendly and obliging service that is definitely more than just the average and reflects quite a bit of attitude. I can highly recommend them and anytime again I would rent one of their vans! This really is "WOOHOO! AS GOOD AS IT GETS!" had the pleasure of “Tassie Motor Shacks” info@tassiemotorshacks.com.au experience earlier this year when I attended Hobart for the first time. Unfortunately not long enough. But I will be returning The service was exceptional being picked up form the airport and returned. The knowledge/maps / books provided was a fantastic help. Jo and Rob are beyond accommodating. They are super-gracious and try to anticipate your any and every need. Based on this first experience, I would love to have another adventure soon (and many more after that) The van came with two chairs, a folding side table, camping stuff, odds and ends and a lot more. I took the van and had heaps of room, cheep to run and easy to park they give you everything you need to be completely self-sufficient. Well done and you are number one in my books and highly recommended to my friends and anyone else in all they went above and beyond in terms of customer service. Your hospitality is over whelming well done 10/10. Roger Gough - you are truly one of the best! We had a backpacker van for 30 days in Tasmania and we were really satisfied with Tassie Motor Shacks. The service and the price were excellent. For no extra charge we were picked up from the airport and could stay at the 7-mile beach camping over Christmas days. The van was clean and well equipped with camping and cooking utilities. It was robust to take us where we wanted to go and we had no problems driving more than 3000 km through beautiful Tasmania. At any rate we would choose Tassie Motor Shacks again and we can really recommend it. Rob was very committed to make our tour as pleasant as possible. Thanks! As we wanted to do a quick 5 day galavant around Tasmania, and also being on a tight budget, we went with Tassie Motor Shacks. Our rental was excellent value for 5 days, greatly cheaper than any of their competitors. We were picked up and dropped off at our hostel in central Hobart for no extra charge, which was great and it gave us the chance to meet Rob, who could not have been nicer. He gave us loads of hints, including about purchasing of a holiday pass for all the national parks instead of individual park passes, which saved us $64, definitely good advice! When we got the van, it was well equipped, and much better than we thought we were going to get. It had everything included (towels, cooking equipment and utensils, gas hob and canisters, bedding, portable light, etc). He also included detailed maps, including one on the inside of the van, which gave estimates of driving times between destinations in Tasmania, which helped us plan how far we could travel day to day. The only flaw was that one of the speakers for the radio didn’t work. The insurance was as standard for most vans in Tasmania, but they were more lenient on allowing you to drive on dirt roads, which some companies didn’t allow. They did note the risks involved, and the extra costs in case of an accident, but at the end of the day, it was all about common sense, and not trying to be a rally driver! All in all, they went above and beyond in terms of customer service, and had no hidden charges, as they explained everything fully before we set out. They even offered us one extra night on top so we didn’t have to rush back on the last day. We would definitely use Tassie Motor Shacks again, and would recommend using them to all of our friends. The best and cheapest way of seeing Tasmania! These campervans offer such value for money and are really well appointed. They provide you with everything you need to tour Tasmania's unique attractions. A holiday on wheels with the freedom to go see Tasmania and stay as long as you like. Good stuff.